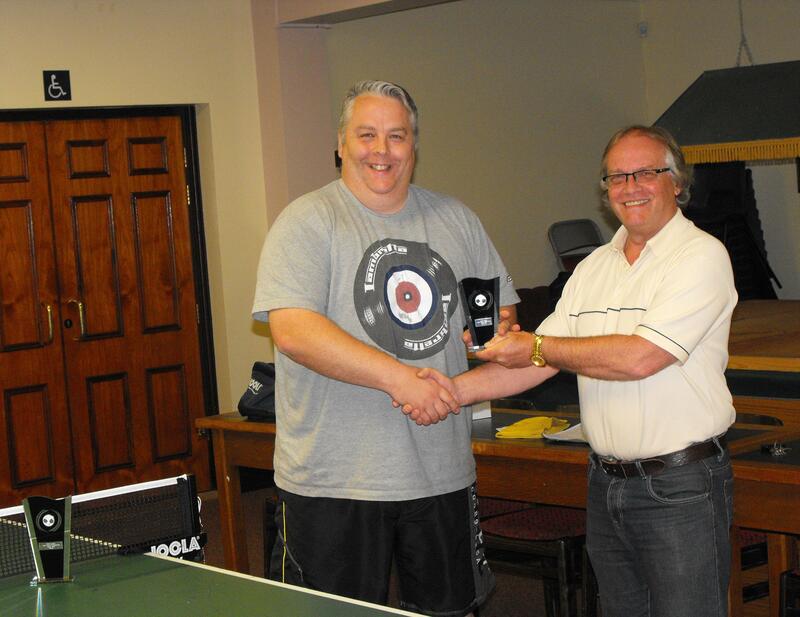 Hi, welcome to Gwent Table Tennis Association's new website. These are exciting times for table tennis in Gwent. This site will keep you updated on the sport we all love in our area, so save it to your favourites file for easy access. Finally, many thanks to John Evans of Newport & District TTL for constructing this site, I'm sure that it will prove a valuable resource for everyone involved in the sport in Gwent.- Gwent TTA Secretary Neil OConnell. Another great weekend for the youngsters from Gwent. After a hard fought weekend of quality Table Tennis Gwent finished 3rd behind Gloucester and Cornwall. With only Gloucester managing a win against Gwent all weekend. 3rd place was confirmed on count back after finishing with the same amount of points as a very strong Cornwall side. Our girls had an excellent weekend with Cerys finishing the only player of the weekend with a 100% win record, and Bethany only dropping one match. The boys had a tougher weekend against some very good English opposition, Ben did very well winning 10 from 12 matches at number one with Iestyn and Sam gaining valuable experience. Compliments again from organisers on our players attitude and team spirit, it was nice to see all our players enjoying a warm up game of football during the bye match on the Saturday morning. Again well supported by an enthusiastic group of parents, some of which joined the football whilst Deb was spotted having a sneaky knock towards the end of the second day. The Gwent Closed Table Tenis Championships were held on Saturday 5th May. A total 0f 27 competitors and with 4 events to play the Veterans and Junior categories commenced at 9.30. Both started with 2 groups of 4 players playing a round robin with the top 2 going through to the semi final. The Seniors and Cadet events were set for the afternoon and got underway just after 12.30. The cadets were placed into 3 groups of 4 and the Seniors into 2 groups of 5 again the top 2 going forward to the knockout stage. County - Round one at Bristol Civil Service Club Saturday 12th November. Although it was a big step up for some from the Cadets to the Juniors, the gwent squad played very well, winning one and losing two but one of those was very close. Another report and photo to follow from Jonathan soon. 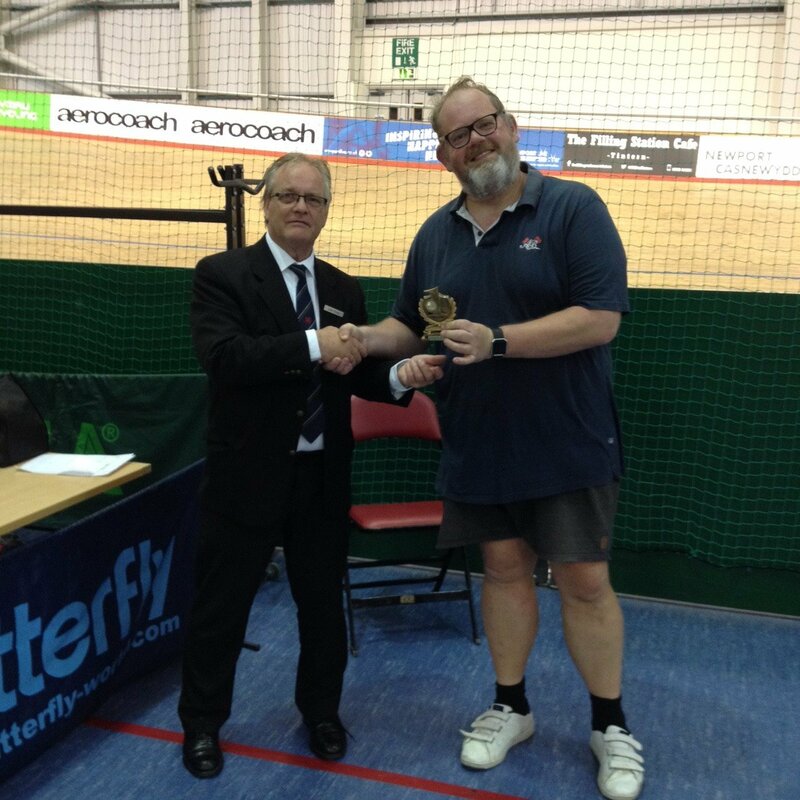 The was a total of 20 entrants for the Gwent Closed in the Senior, Veteran and Junior events held at Newport Velodrome. The 2 finals were a complete contrast where Lee Thomas showed his class by winning comfortably in 3 sets over Mark Edmunds, but the Junior final was a much more evenly balanced affair with Ben Allen beating Elis Burgess in 5 close sets.In the afternoon the senior event started again with a round of group matches resulting in 8 Quarter-finalists:-Lee Thomas, Claire Flannagan, Andrew Ryder, Piotr Sniezek, Mark Edmunds, Ben Allen, Ray Goulding and Jon Allen. Of the quarter final matches the outstanding match was Claire Flannagan v Lee Thomas where Claire took a 2 sets to love lead and Lee was under real pressure to come through. Lee though managed to come up with a few serves and some better topspins to take the next 2 sets so the it was all on the final end. This was a real ding dong affair with each player taking the lead only to lose it and the other player take over but it was Lee who managed to have the lead at just the right time taking the final set 11 points to 9. 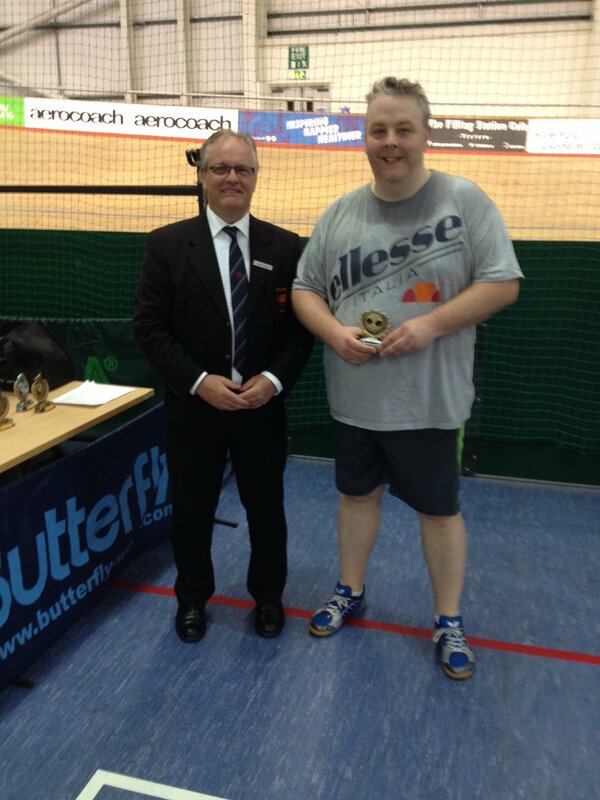 The final saw Lee back in total control winning again comfortably in 3 sets against Jon Allen. Report for Gwent Cadet County Team 9/4/16. I would like to start this weekends report by once again thanking the parents for not only giving up their Saturdays for the long drive down to Southampton, but for the support they once again showed the whole team, not just their own children, it really does help, not only with the support to the children but the constant refills of tea also were appreciated! Onto the team, I think this weekend would be wrong of me to pick a player of the weekend, there was some outstanding individual performances worthy of mention such as Bethany winning all of her matches, Bens titanic five setter against the Wiltshire number one, Ellis grit and determination, Callum picking up wins as well as Cerys and both reserves coming in and doing themselves proud. For me this was all about the team performance, all of the players supported each other, knocked together between matches, were always encouraging each other and when one of them had lost, their teammates were there to pick them up for the next match. It was truly a team display from start to finish which I feel paid off in the results. I have to say the behavior on and off the table was impeccable, whether they were winning or in the tough 10 - 0 defeat against a very good Devon side. When you get happy players combined with the hard work on the table, as a coach, it doesn't get any better. 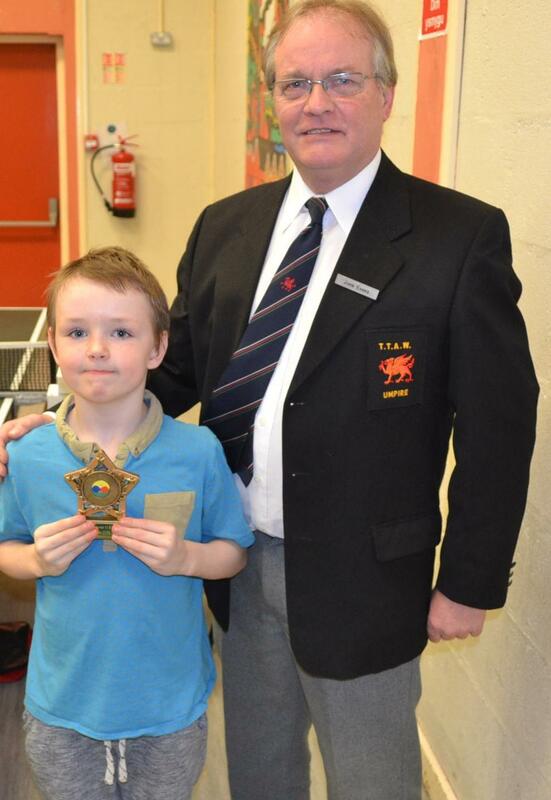 53 entries were received for the Gwent Junior and Cadet Closed Tournament 2016 and all affiliated Leagues and clubs had players taking part in the event held at Aelybryn Table Tennis Club on the 24th of January. Boys under 10 event was an extra age category added due to demand from local youngsters, and this got underway at 9am. 7 year old Jordan Price was the winner from Dylan Dyer. Also underway was the Boys and Girls Under 13 events. In the Boys event progressing through to the semi finals were Samuel Slater, Mason Williams, Ben Allen and Lewis Parker. 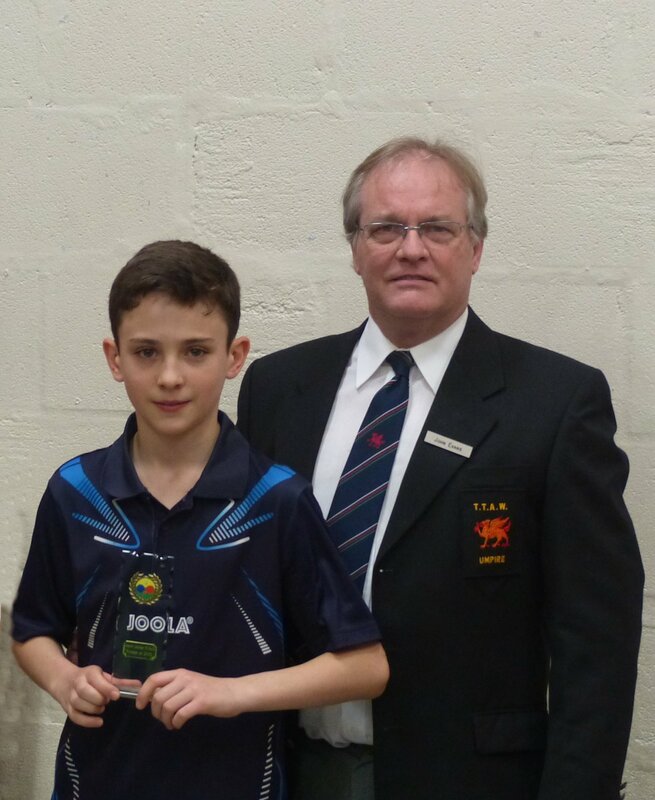 The final saw Ben playing Lewis, with Ben Allen taking the win and Gwent Under 13 Boys title, in straight sets. Girls Under 13 event had 5 quite evenly matched players in a round robin group. In the end it was Kayla Evans who won from Ruby Elliot. 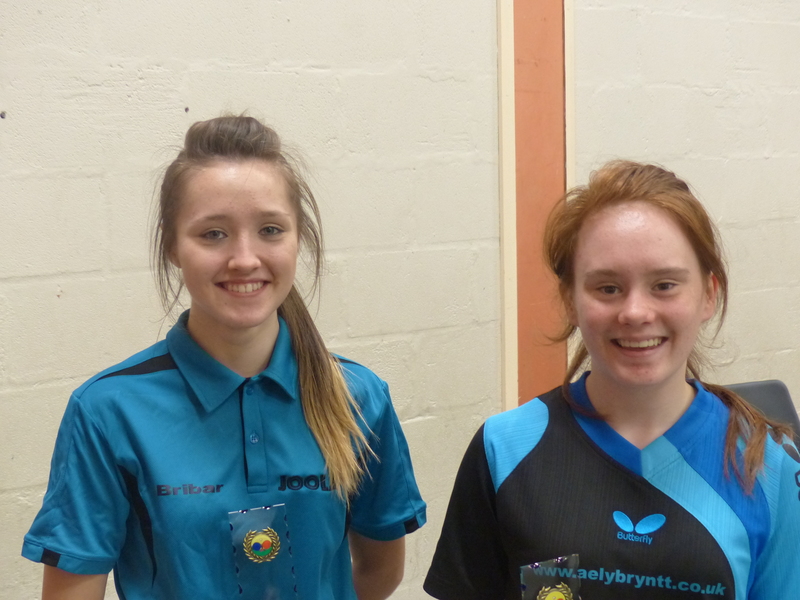 Consolation medals were also awarded in this event and these went to Holly Evans and Mali Diggle. The Cadet Boys and Girls events were next, the boys in particular was a close event played in 3 groups of 3 players. Making the top group for final positions was Ben Allen, Matthew and Ben Pearce. This final group lived up to expectations with all 3 beating each other leading to a countback situation. With the maths done it was Ben Pearce who took the title from his brother Matthew, Ben Allen being just edged out of a trophy. 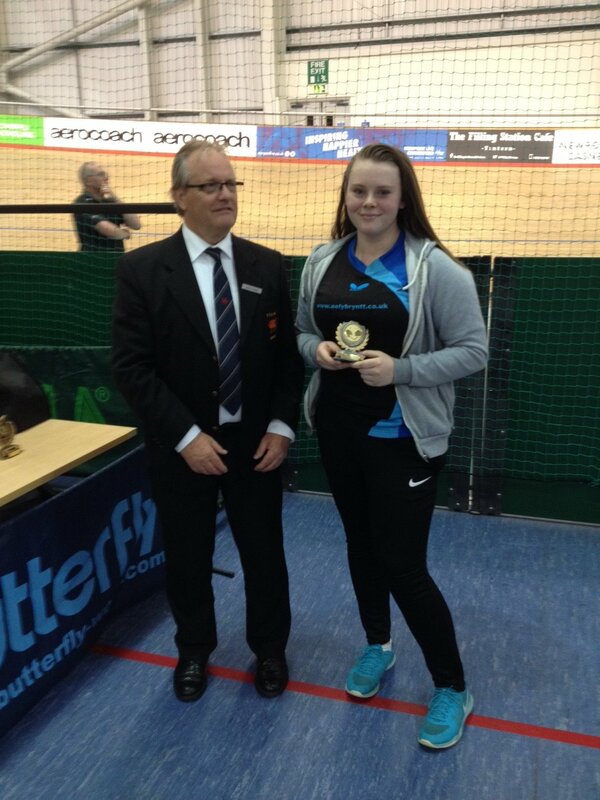 The Cadet Girls title was taken by a delighted Cerys Evans, from runner up Kayla Evans. Junior Girls were next up, this was won by Bethany Brewer, runner up was Cerys Evans adding to her trophy haul. The afternoon was all about the boys with both Junior and Under 11s groups getting underway. In the under 11s Reegan Diggle, Jack Llewellyn and Mason Williams made the top group playing for the top places. The Under 11s title was taken by Jack Llewellyn from runner up Mason Williams in another tightly contested final group. The Junior Boys semi finals saw Ben and Matthew Pearce playing each other whilst Elis Burgess and Ben Allen made the other semi. The finalists were Matthew Pearce and Ben Allen and spectators were treated to a great evenly matched final. 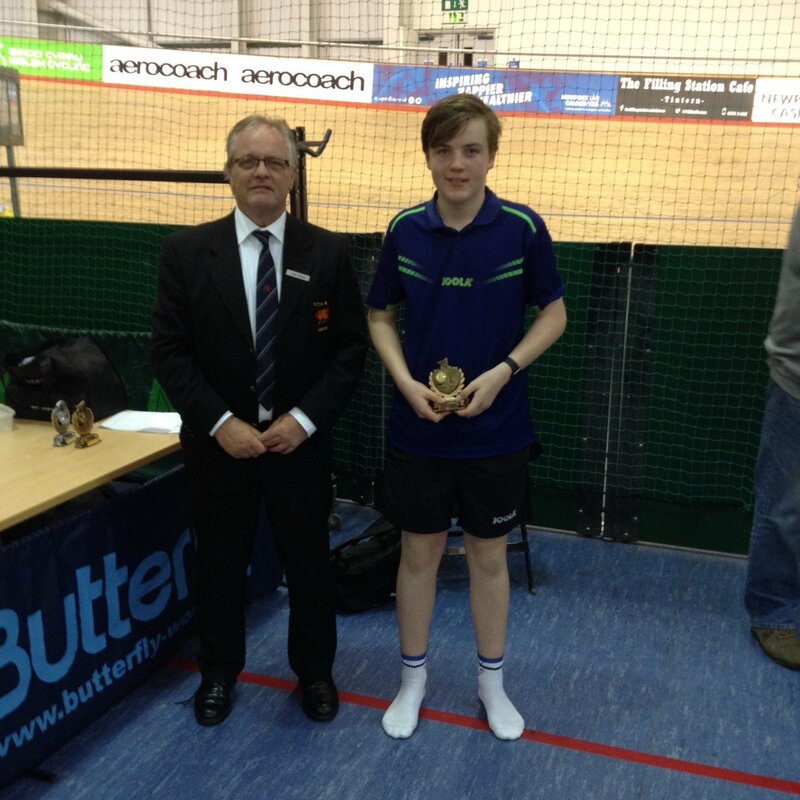 The Junior Boys title was taken by Matthew Pearce from runner up Ben Allen. There ended the tournament, a successful day by any measure, many thanks to players, parents, coaches and Gwent Chairman John Evans who was on hand to make the presentations. Despite this being a division 1c match on looking around the hall first thing it was always going to be a test for the young Gwent squads first outing in the county championships, and was going to be good experience and a steep learning curve. The first game of the day saw us playing Sussex 3 which saw us in a narrow defeat 4 - 6, wins coming from an in form Ellis Burgess (2) Bethany Brewer and Cerys Evans. The second game of the day saw us playing the more experienced Sussex 2. This game ended in an 8 - 2 defeat, but did see the introduction of one of our reserves Josh Buttle who worked hard and managed to take a set of a far more experienced opposition, Gwents wins in this game came again from Ellis Burgess and Ben Allen. The third game of the day saw us drawn against Surrey 2 and this time saw the introduction of both reserves Josh Buttle and Soha Shanbhag, again both played above and beyond what was expected of them, Josh again picking up odd sets. Bethany Brewer on this occasion winning both of her games with the impressive form of Ellis Burgess seeing him adding another win to his haul for the day. The last match saw us against the impressive Surrey 1 and on the wrong end of a 10 - 0 defeat, again Soha Shanbhag gaining valuable experience. 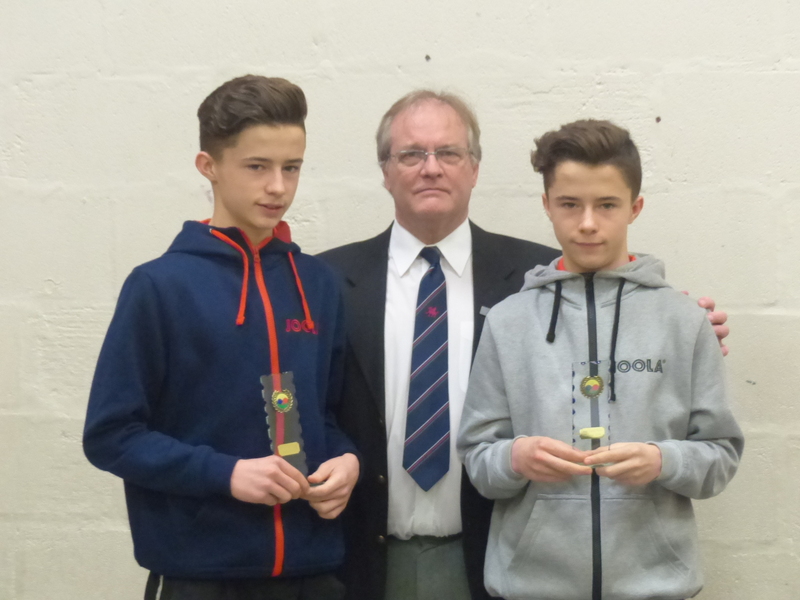 The defeat itself did not reflect the impressive table tennis that was on offer in this match and in particular Ben Allen and Ellis Burgess played above their years and showed fight, determination and the ability to rally with their more experienced and older opposition. Great squad ethics, the team all supported each other even if they werent included in that match. It was good to see the reserves made the journey to support and this was rewarded in gaining valuable experience. The attitude of the whole squad was exceptional on the day and the support from travelling families must also be noted. All the players played in the way we would expect to see someone representing the county. 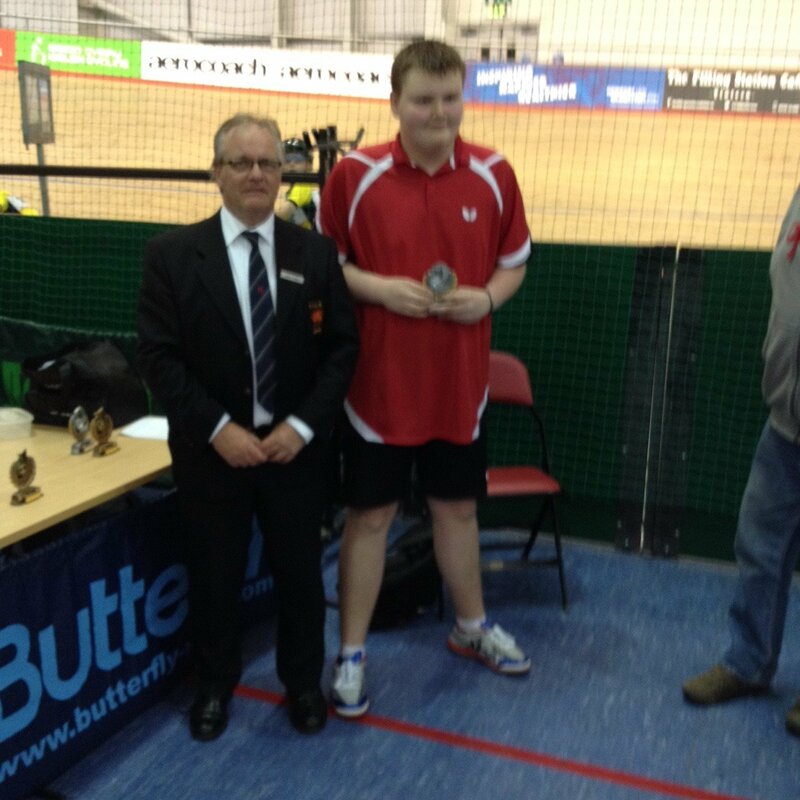 And player of the weekend must go to Ellis Burgess who battled hard to win 4 out of his 8 matches. :- Ben Allen, Elis Burgess, Callum Hunt, Josh Buttle, Bethany Brewer, Cerys Evans, and Soha Shanbhag. Well done everyone and good luck. The first training session of the Gwent Cadet team was held on Wednesday November 4th at Abertillery Sports Centre under the coaching of Dave Allen and Greg Price. The main aim of this first session was to make sure we have enough players of a standard good enough to enter the English Cadet County Championships which begin in December. This I am sure was achieved and also showed that we have a few good reserve players as well. Speaking to some of the players afterwards, it seems the session was a success. Players taking part were, Ben Allen, Elis Burgess, Callum Hunt, Matthew Cullingford, Josh Buttle, Iestyn Howells, Bethany Brewer, Cerys Evans and Soha Shanbhag. Also present was Neil OConnell and John Evans who are officers of the Gwent Table Tennis Association. Personally, I would like to thank Greg for organising the hall, Neil and John for supporting, and all the players and parents for turning up.